Grubzon - A Gourmet Voyage: South African Food Festival at Cafe Pondichery at Sofitel - BKC, Mumbai. South African Food Festival at Cafe Pondichery at Sofitel - BKC, Mumbai. Food festivals are becoming quite a thing in Mumbai but surely people must be tired of the same old Middle Eastern, Iranian, Indian and Asian food festivals. I know I am. 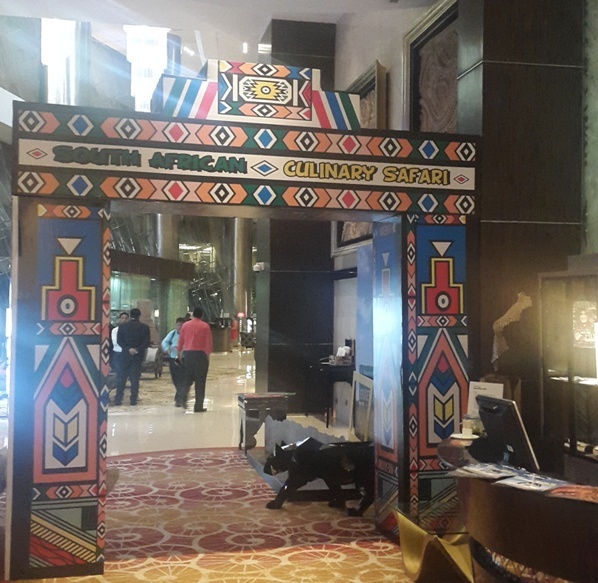 Its rare to see continental African and South African food in Mumbai for a change. 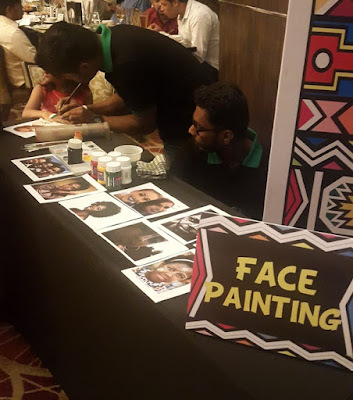 Rising up to the occasion, Sofitel Mumbai has hosted yet another exotic food festival from a land whose food we Indians do not know much about. It is indeed time to take a break from the same old cuisines and try out something new. And unlike the previous Turkish food festival, this one is more than just food. There are African drummers playing tribal music, face painting and hair braiding kiosks. All in all, the mood feels very African. 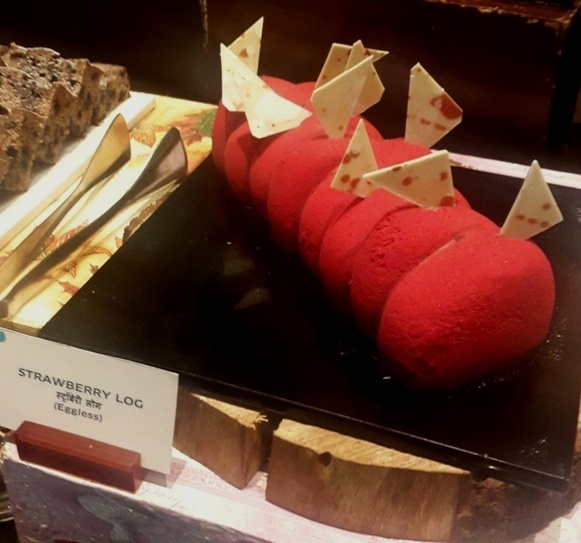 To celebrate the Rainbow nation's fiftieth independence day, Cafe Pondichery has rolled out a South African food festival. 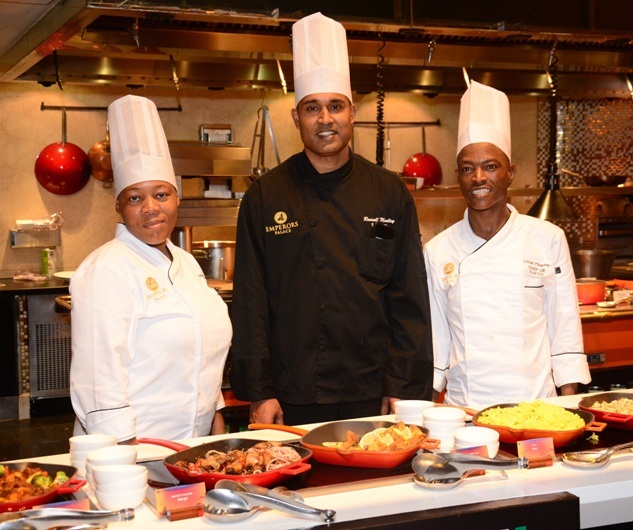 The South African food is specially prepared by a trio of pleasant chefs flown in from South Africa. Chefs Vasathan Moodley, Mavis Netshituka and David Aobakwe Phagane will be joining Sofitel's resident chefs for the event period till May the 7th, 2017. The South African food stand is a welcome addition to the already huge multi cuisine buffet platter of Cafe Pondichery. There were two stands this time, one for the mains and another one for live food near the restaurant's entrance. Do note that the dishes rotate in the buffet everyday and the things mentioned here may not be found on the day you visit. Live Music to drum up your spirits. Kiosks for kids and the occasional adults ha. Here are some of the things that I sampled. 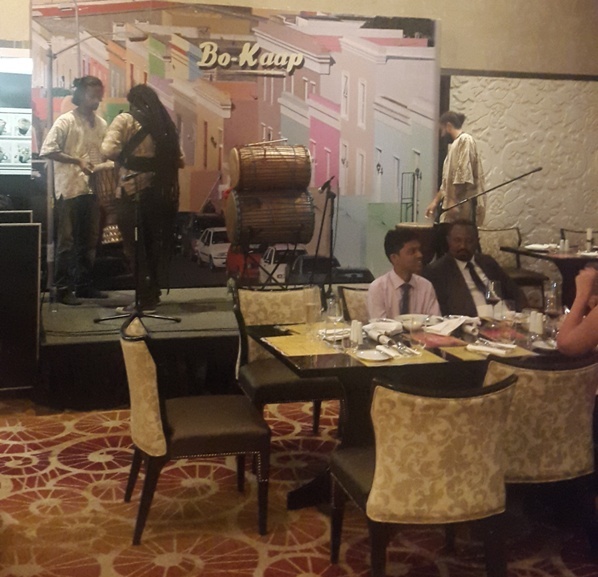 The live counter had offerings like Bunny Chow which has surprisingly originated from the South African Indian community. It has been quiet popular in town but somehow I have not quite bought into the idea, preferring to have the curry and bread separately. There were two options available - Lamb and Mushroom curry. The Lamb curry felt very familiar to the Indian flavors that I am accustomed to. I assume that it comes from the Indian origins behind the dish. The live counter also had a few desserts like Lemon Tarts and Koeksisters(more on this later). Tilapia and Leek soup. Though Tilapia cooking is often attributed to West African cuisines. 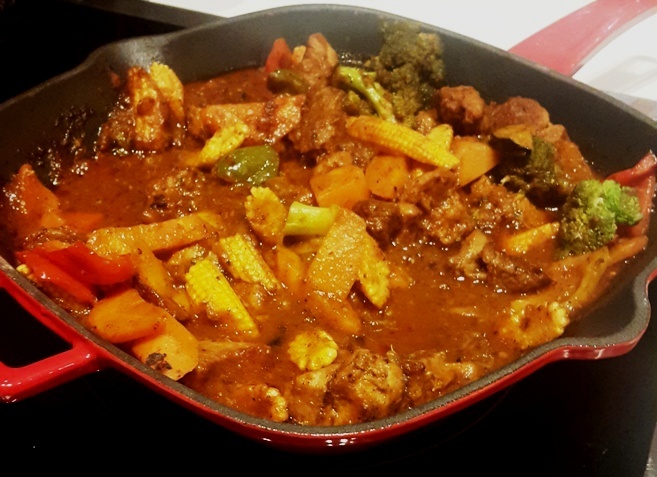 It has been brought into the Rainbow nation's culinary sphere and adapted to the native palates. The result over here was a flavorful concoction. It was quite an experience to have a fresh water fish other than Basa. 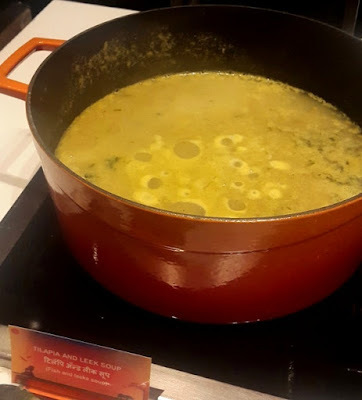 Again a soup you would rarely find in Mumbai. Tilapia is only found in African rivers. Pap and Sheba was a South African favorite that was adjusted for vegetarians. 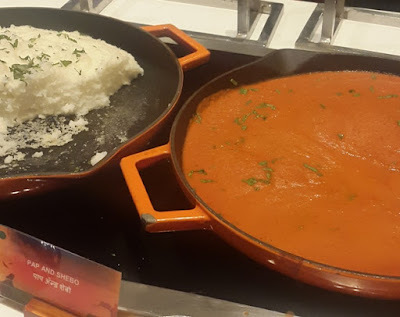 Made with a fluffy polenta like white cornmeal preparation called pap and served with "Tamatiesmoor" or Sheba which is a South African tomato and onion gravy. It was an easy on the palate, satisfying dish that anyone could eat. The gravy had a very addicting flavor. Pork Casserole had a subtle flavor. The texture of the stew felt a bit rough on the tongue. The flavor had a frontier feel to it. And as last time, Cafe Pondichery has an amazing dessert platter. It was mostly different from last time and I pounced upon it like a ravenous gourmand. But sticking to the South African theme, lets revisit the live counter for Koeksisters. 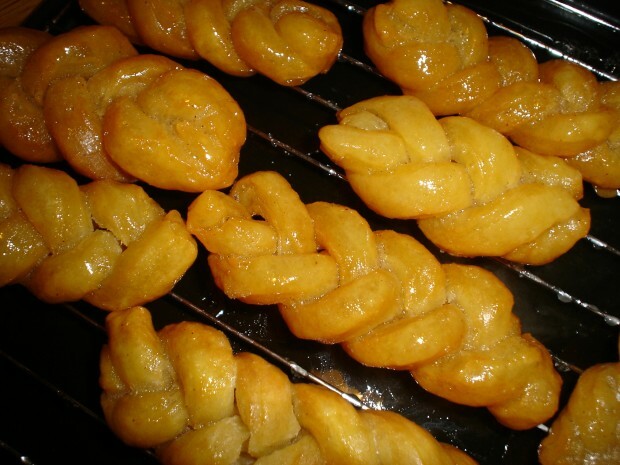 Koeksisters was a South African dessert which was made of fried dough strips shaped like braids and infused with Maple syrup. The flavor was delectable and this was the first time that I have had this. It was a wonderful first experience. Adds to my list of Fried Dough based desserts like Jalebi and Churros. Combined with the impressive multi cuisine platter, the experience at Cafe Pondichery is always an amazing one for me. The buffet servings are some of the most satisfying that I have had anywhere. Its real value for money. With an appetite like mine, the buffet is a food paradise. Do note that the festival concludes on Sunday, May the 7th, 2017. 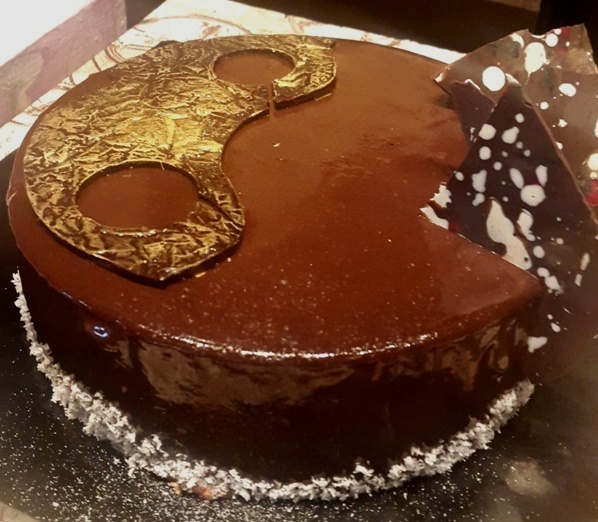 However, the complete buffet experience at Cafe Pondichery itself is worthy of a visit for any food lover. Bohemian Brew - Khar, Mumbai.